What would summer be without the traditional barbecue? Alastair Hendy reels in a deliciously different way to serve fish at a barbecue When the weather's balmy, we all love to eat good food in the garden and chat with friends. The secret of a good barbecue, however, is to do one thing well, rather than feeling obliged to serve your guests lots of different options. 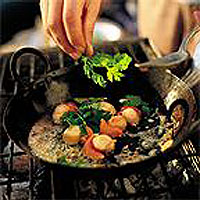 The scallops cook in a shallow pan on the barbecue. You can flavour the butter with other herbs - try finely chopped lemon grass and grated lime rind with basil leaves; or fresh dill and grated lemon rind with chive stems. Mash butter with garlic, ginger and chilli. Sprinkle scallops with sea salt. Place the butter mixture in a small baking tin on the barbecue. Allow to bubble so chilli and ginger flavour permeates it. Add scallops, season and cook for 2 minutes. Turn each scallop and cook for 30 seconds. Serve topped with coriander leaves.